Shop for WWE tickets right now and discover a huge selection of World Wrestling Entertainment tickets available. Purchasing WWE tickets here is simple, safe and secure. Either choose the WWE fight above by clicking the 'Tickets' button or call us at 1-866-837-0608. Above is the World Wrestling Entertainment event schedule. Click on any of the red 'Tickets' buttons to see all the available seats for that WWE fight, along with an interactive seating chart that will help you locate the best seats for your price. You'll have to choose how many seats you want to purchase for the WWE event, and then you'll be brought to our secure checkout. Whether you want ringside tickets, upper or level tickets, VIP tickets, cheap WWE tickets, sold out professional wrestling tickets, or premium tickets for any WWE bout, you can usually buy them here. We offer everything from ticekts to WWE Raw, WWE Smackdown, WWE Starrcade, Summerslam, Wrestlemania, WWE: NXT Live vs. WWE and much more. WWE ticket prices may be above or below face value and can fluctuate. 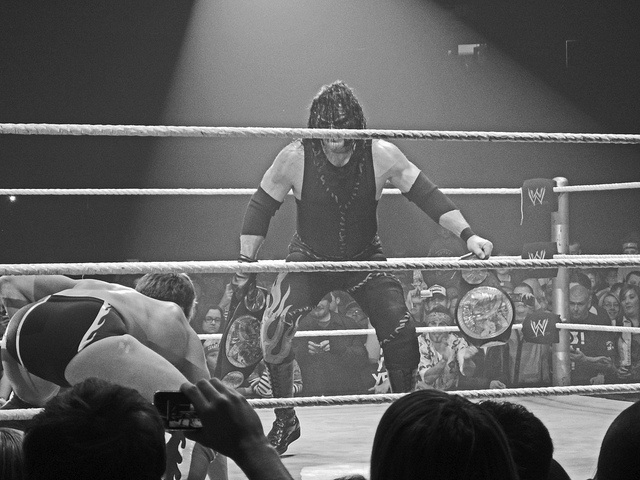 You'll find World Wrestling Entertainment tickets here at relatively affordable prices. To find the current pricing, click the red 'Tickets' button above. You'll be brought to the seating chart where you can sort from the cheapest to the highest pricing. Discover a wide range of cheap WWE tickets, including discount seats or last-minute and low-priced deals here. You can rest easy because all our tickets are 100% guaranteed. All ticket sales are final. Our WWE fight tickets are unique and can't be replaced, therefore there are no exchanges or refunds. If an event is rescheduled or postponed, your tickets will be honored for the new date. Learn more. You can choose either standard or express delivery and you can specify special delivery instructions if necessary. Your fight tickets will be shipped to you using Federal Express. Also, some WWE fight tickets may be available for immediate download as e-tickets, or electronic tickets. In 1985, McMahon also dreamed up WrestleMania, a national pay-per-view event that he promoted as the Super Bowl of wrestling. The inclusion of celebrities such as Muhammed Ali, Cyndi Lauper, and Mr. T helped make the first WrestleMania a success. Mid-1985 also saw Saturday Night&apos;s Main Event debut on NBC, the first network wrestling broadcast in decades. When Hulk Hogan faced off against Andre the Giant in WrestleMania III, some 33 million viewers tuned in making it the most-watched wrestling event in North American history. The &apos;90s were plagued with steroid abuse and sexual harassment allegations causing a downturn in the WWF&apos;s popularity. The expensive problems drove many of McMahon&apos;s wrestlers and employees to his main competitor – Ted Turner&apos;s World Championship Wrestling (WCW). McMahon hit back with WWF Monday Night Raw; Turner countered with WCW Monday Nitro, eventually winning the ratings brawl. When fighters such as Psycho Sid, Rick Rude, and Razor Ramon defected, McMahon brought in a new stable – including Vader, Stone Cold Steve Austin, Brian Pillman, Mankind, and Farooq – all culled from WCW&apos;s roster. By the late 1990s, McMahon had pushed the WWF&apos;s bad guy reputation even further, creating feuds between fighters, broadcasting more violence and swearing, and generally sharpening the edge. In 1999, SmackDown! was born on the UPN network and, once again, found itself in direct competition with a WCW program, WCW Thunder. By that point, the WWF was winning the Monday night ratings war thanks to the Time Warner merger with AOL leaving Turner with less control. The newly formed company eventually sold WCW to WWF. Now christened WWE and without any direct competition in North America, McMahon&apos;s venture split into the two strains of Raw and Smackdown. Various network deals came and went, taking WWE from TNN back to the USA Network. In 2006, Saturday Night&apos;s Main Event also returned to NBC after a 13-year hiatus. WWE even made the leap to HD broadcasting and social networking (WWE Universe) in 2008. Also that year, in a move to expand its demographic appeal, WWE softened its edges a bit to become more family-friendly. By 2010, women and children comprised about 40% of WWE&apos;s audience.